PyOPUS is a library for simulation-based optimization of arbitrary systems. It was developed with circuit optimization in mind. The library is the basis for the PyOPUS GUI that makes it possible to setup design automation tasks with ease. In the GUI you can also view the the results and plot the waveforms generated by the simulator. PyOPUS provides several optimization algorithms (Coordinate Search, Hooke-Jeeves, Nelder-Mead Simplex, Successive Approximation Simplex, PSADE (global), MADS, ...). Optimization algorithms can be fitted with plugins that are triggered at every function evaluation and have full access to the internals of the optimization algorithm. PyOPUS has a large library of optimization test functions that can be used for optimization algorithm development. The functions include benchmark sets by Moré-Garbow-Hillstrom, Lukšan-Vlček (nonsmooth problems), Karmitsa (nonsmooth problems), Moré-Wild, global optimization problems by Yao, Hedar, and Yang, problems used in the developement of MADS algorithms, and an interface to thousands of problems in the CUTEr/CUTEst collection. Benchmark results can be converted to data profiles that visualize the relative performance of optimization algorithms. The ``pyopus.simulator`` module currently supports SPICE OPUS, HSPICE, and SPECTRE (supports OP, DC, AC, TRAN, and NOISE analyses, as well as, collecting device properties like Vdsat). The interface is simple can be easily extended to support any simulator. PyOPUS provides an extensible library of postprocessing functions which enable you to easily extract performance measures like gain, bandwidth, rise time, slew-rate, etc. from simulation results. The collected performance measures can be further post-processed to obtain a user-defined cost function which can be used for guiding the optimization algorithms toward better circuits. At a higher elvel of abstraction PyOPUS provides sensitivity analysis, parameter screening, worst case performance analysis, worst case distance analysis (deterministic approximation of parametric yield), and Monte Carlo analysis (statistical approximation of parametric yield). Designs can be sized efficiently across a large number of corners. PyOPUS fully automates the procedure for finding a circuit that exhibits the desired parametric yield. Most of these procedures can take advantage of parallel computing which significantly speeds up the process. Parallel computing is supported through the use of the MPI library. A cluster of computers is represented by a VirtualMachine object which provides a simple interface to the underlying MPI library. Parallel programs can be written with the help of a simple cooperative multitasking OS. This OS can outsource function evaluations to computing nodes, but it can also perform all evaluations on a single processor. Writing parallel programs follows the UNIX philosophy. A function can be run remotely with the ``Spawn`` OS call. One or more remote functions can be waited on with the ``Join`` OS call. The OS is capable of running a parallel program on a single computing node using cooperative multitasking or on a set of multiple computing nodes using a VirtualMachine object. Parallelism can be introduced on multiple levels of the program (i.e. parallel performance evaluation across multiple corners, parallel optimization algorithms, solving multiple worst case performance problems in parallel, ...). PyOPUS provides a plotting mechanism based on MatPlotLib and wxPython with an interface and capabilities similar to those available in MATLAB. The plots are handled by a separate thread so you can write your programs just like in MATLAB. Professional quality plots can be easily exported to a large number of raster and vector formats for inclusion in your documents. 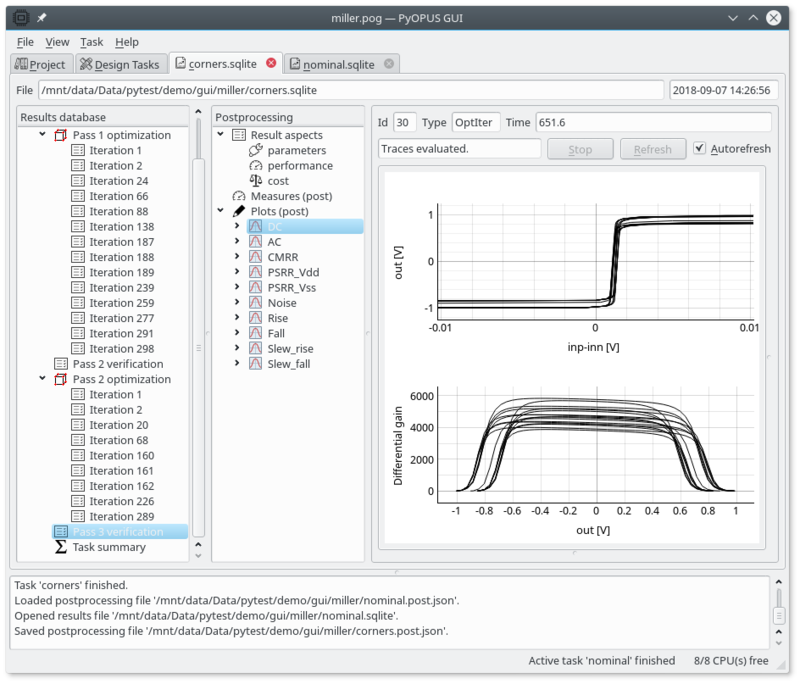 The plotting capability is used in the ``pyopus.visual`` module that enables the programmer to visualize the simulation results after an optimization run or even during an optimization run. The latest version of PyOPUS is 0.9. Older versions are available in the download section. PyOPUS is being developed by the Computer-Aided Circuit Design Laboratory at the Faculty of Electrical Engineering, University of Ljubljana, the home of a popular free circuit simulator SPICE OPUS.